Elizabeth is an advocate for the Eco-Soap Bank, an American nonprofit that recycles used hotel soap into new bars of sanitized soap that it distributes to needy schools, orphanages and hospitals in the developing world. Watch this to learn more about how Eco-Soap Bank is turning someone else's rubbish into a life-saving resource - soap! 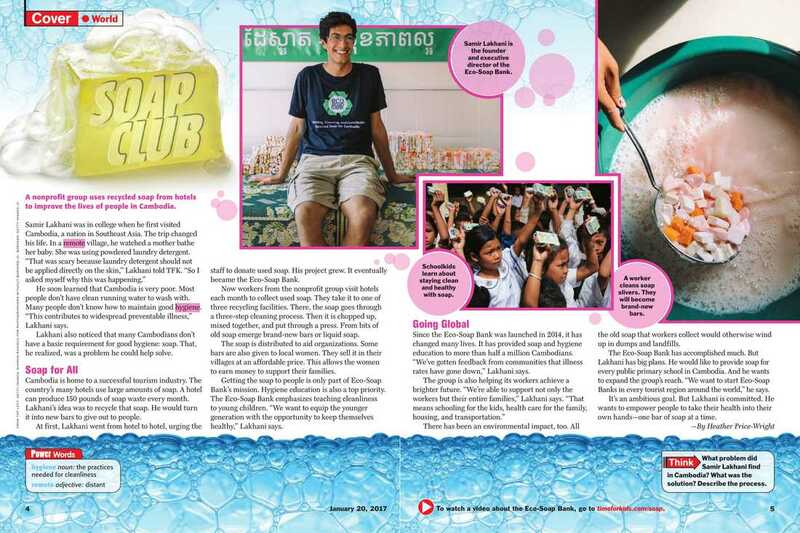 Eco-Soap Bank was featured in the 1/20/17 issue! Organize a fundraiser at your home or school! It takes only pennies to save lives in Cambodia. Anyone at any age can make a difference! Ask your principals, teachers, librarians, parents or church leaders to hold a fundraiser! Then, ask them to donate the proceeds using the link below. Need more information? Visit the Eco-Soap Bank website!